John Delaney has told friends that he will be stepping down from his position as FAI Executive Vice President. Delaney’s position within the FAI has been the subject of high level talks across the last 24 hours, and Independent.ie understands that an agreement on his departure was reached in the early hours of Saturday morning, and that Delaney met with some of his long-term backers to tell them of his departure on Saturday. Radio Kerry reported this evening that John O’Regan from the Kerry District League is one of the people to have been contacted by Delaney. The FAI’s President Donal Conway was in the organisation’s Abbotstown HQ today along with their Head of Communications and a staff member from their finance department. They left shortly before 6pm. However, FAI sources are adamant there will be no statement today on the future of their Executive Vice President. It followed on from high level discussions over the weekend centred around the position of Delaney. Strong doubts also surround the FAI future of Honorary Secretary Michael Cody – the only existing board member who was aware of Delaney’s €100,000 loan in 2017. Honorary Treasurer Eddie Murray – who was not aware of the transaction – is not expected to be part of the Association’s board going forward. Cody has not been involved in some of the board talks around the future, with a sub committee headed up by Conway leading the FAI’s response. The Executive Vice President has come under renewed pressure in the aftermath of his appearance in front of the Oireachtas Committee on Sport on Wednesday. Independent.ie understands that members of the FAI Board who were previously supportive of Delaney have now started to harbour reservations about the 51-year-old staying on with the association. 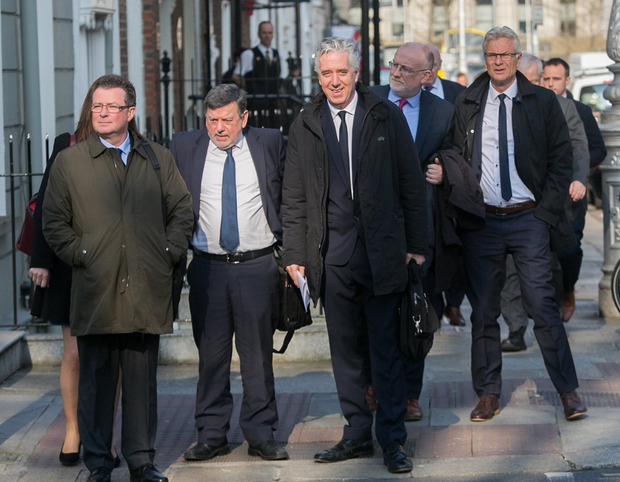 Delaney was silent for large parts of his appearance at Leinster House due to legal advice which precluded him from elaborating in detail on the circumstances behind his €100,000 bridging loan to the FAI in 2017. It has subsequently emerged that only three members of the board were aware of the transaction at the time. Scrutiny on all levels of the FAI has increased over the past week, with primary sponsors Three and New Balance releasing statements to say they were keen for recommendations from ongoing reviews into governance and finances to be adopted by the board. It’s believed that another complication for the FAI is that deals with their main sponsors are up for renewal after Euro 2020 and discussions about re-negotiation would normally be expected to accelerate in the coming months. There is a belief within FAI circles that immediate changes to the current board will be required as part of the attempt to rebuild confidence in the organisation. Delaney’s contacts within UEFA and FIFA were cited as a key factor in his switch from CEO to Executive Vice President. He will be a member of UEFA’s Executive Committee until 2021 but would not be able to seek re-election then unless he was titled as President, Vice President, CEO or General Secretary with his national governing body.